Here’s Satomi, a 20-year-old Japanese college student who we snapped on the street in Harajuku. 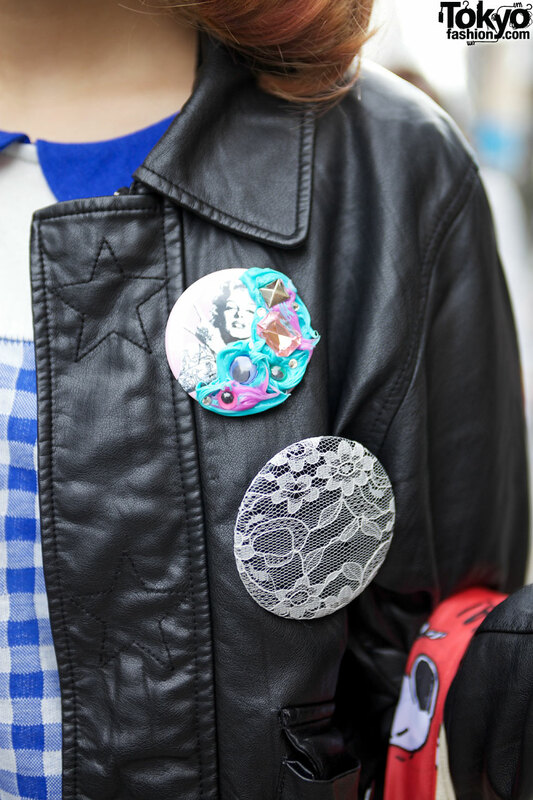 We have photographed Satomi around Harajuku in the past and her style is always cute. Satomi is wearing a leather jacket from the Japanese brand World Wide Love over a cute gingham dress from the Cat Street brand Candy Stripper (just a few feet from where we took these photos), tattoo tights, ruffle socks, and black & white creepers. 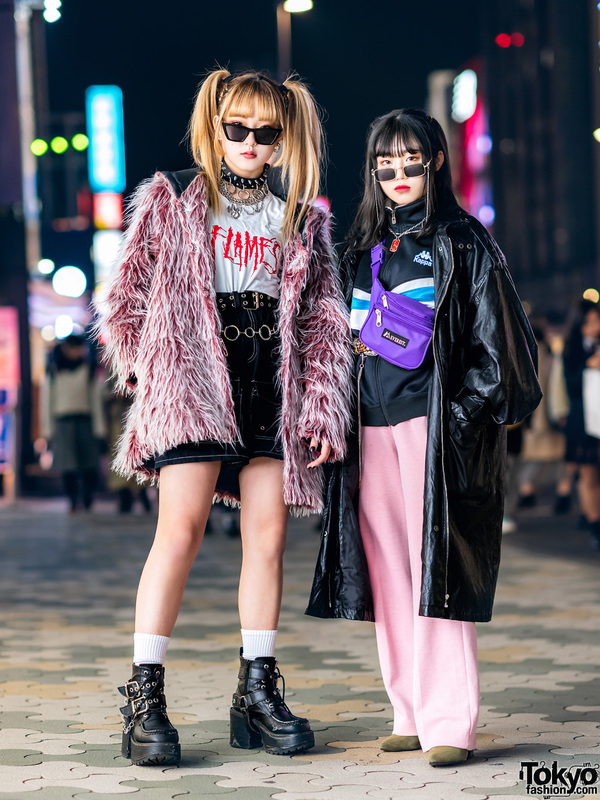 Accessories include lace hair bows, several buttons from Monomania, a Monomania medallion ring, a canvas bag with a heart on it from Nadia Harajuku, and a Snoopy bag from Candy Stripper. Her nail art – featuring stars, crosses, cherries and skulls – is definitely worth checking out too! 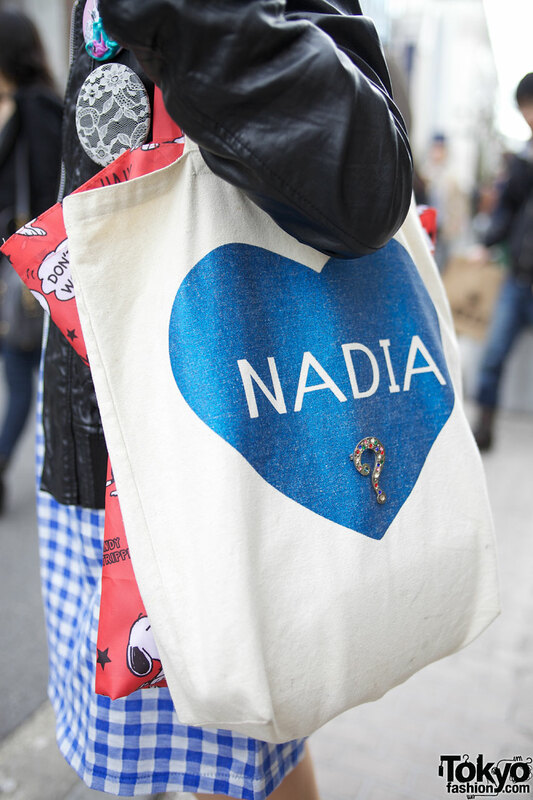 Satomi’s favorite brands include the Harajuku icons Candy Stripper, Nadia and Monomania. Her favorite band is The Kiddie. If you’d like to keep up with her fashion and life, check out Satomi on Twitter. She has exactly the same facial expression as the last shoot! That must be her practised pose :D I love that nail art. Looks like transfers maybe? Very cute & nice accessories!!! She looks kind of bummed out to me. she also looks like Dorothy from the Wizard of Oz… even standing on a brick path.